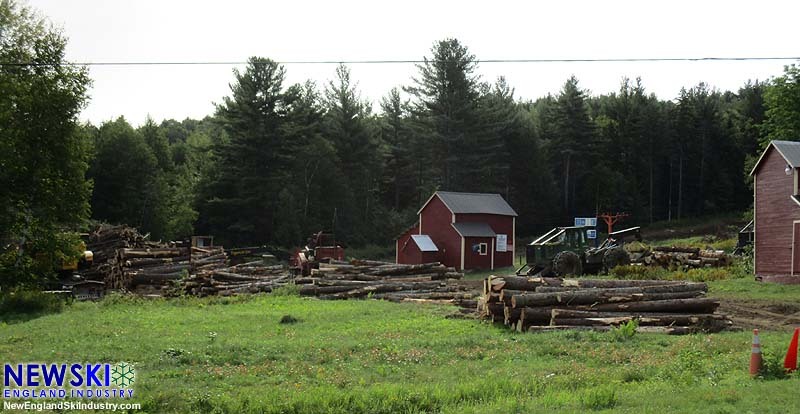 Large scale logging operation in progress. A large scale logging operation is in progress at Mt. Abram amidst rumors that multiple new trails are being cut. Mt. Abram did not respond to a request for comment. The logging operation is currently being staged at the bottom of the tubing area on the east side of the main base area. One of the rumored trails may be cut just above this area, in the vicinity of Roundabout. Additional new terrain is rumored near Boris Badenov, the summit, and the West Side, however no cutting was visible from the main base area on August 29. After years of financial problems and ownership changes, the Greenwood ski area was sold to Matt Hancock and Rob Lally in 2008. Five years later, Mountain Rider's Alliance was hired to operate the area. The vintage lift infrastructure includes two double chairlifts and two T-Bars. A temporary lodge has been in use since the main lodge burned in 2011. A solar farm was constructed adjacent to the base area in 2014.